If your home was built in the 1960’s or earlier. Over the past fifty years, we have dramatically changed the way we live in and use our homes. Houses built in the 1960’s and before were engineered and built for the way people lived back then. In the 1960’s, most people only had one television in the house. Many rooms were lit only by one or two table lamps or possibly a single ceiling fixture. Additionally, homes back then typically did not have central air conditioning. If you have 2-prong outlets. This type of outlet only has a provision for a hot and neutral, but no provision for an equipment ground. Most lamps or simple electronic devices will work with this type of outlet, but high tech electronics or appliances with a metal shell such as a refrigerator, range, or laundry machine require a separate ground. Also called a “safety ground”, the equipment ground “bonds” the metal components of the appliance to the ground bar in the electrical panel. By bonding the metal components of a device or appliance to the ground bar in the electrical panel, that portion of the appliance cannot become energized due to malfunction or wear and tear. Homes with 2-prong outlets also may still contain cotton jacketed wiring or “BX” wiring, described in the items below. If the outer jacket on your wiring is made of cotton. This type of wiring was very common in homes dating all the way back to the very beginning of the twentieth century. At Root Electric, we have a jargon term for this type of wire. We call it “Old Romex”. For its time it was common for electrical installations, but the insulation for the hot and neutral wire is made of rubber, as opposed to modern thermoplastic. The rubber dry rots and disintegrates when manipulated, causing sparking, short circuits, or ground faults. Please note that homes built after the 1940’s with cotton jacketed wiring usually have modern thermoplastic insulation on the hot and neutral; however, we have found this to be inconsistent between houses. If you have any questions about the quality or condition of the cotton jacketed wiring in your home, please call us or email. If the outer jacket on your wiring is a spiral pattern metal. This type of wiring is called “BX”, which was commonly installed in homes built in the 1940’s, 1950’s and 1960’s. For its time it was the best type of wiring available. Unfortunately, much of the BX wire uses rubber insulation for the hot and neutral wires, just like the cotton jacketed “Old Romex” mentioned above. The rubber dry rots and disintegrates when manipulated, causing sparking, short circuits, or ground faults. Like the cotton jacketed “Old Romex”, much of the wiring installed after the 1940’s has thermoplastic insulation on the hot and neutral, but we have run across some homes built in the 1950’s and 1960’s that still have rubber insulation on the hot and neutral. As before, if you have any questions, feel free to call us or email. If you have aluminum wiring powering your lights and outlet receptacles. Aluminum wiring is commonly found in and around homes today. In fact, the power company uses aluminum wires to distribute power to your home. Additionally, some large appliances, such as kitchen ranges, heat pumps, and electric furnaces are commonly and safely installed with aluminum wires providing electricity. From 1965 to the mid 1970’s a copper shortage caused builders to increase usage of aluminum in residential wiring. (www.cpsc.gov) Builders began using aluminum for wall outlets and lighting, which were previously only wired using copper. Aluminum wiring tends to fail at the connections and splices when incorrectly installed, causing sparks that lead to heat buildup and potentially fire. While we rarely see problems with aluminum wiring connections on large appliances, we do see problems at outlet receptacles and light switches that are wired with aluminum. Most commonly these problems arise when the original outlets or switches, which were designed to be installed with aluminum (also called “ALR” devices) are replaced with “copper only” devices by a homeowner, handyman, or electrician who is not familiar with the nuances of aluminum wiring. Additionally, when aluminum is spliced with other aluminum wiring or copper wiring, a special wire connector that contains an oxidation inhibitor must be employed to keep the splice from corroding and breaking apart. While there are solutions to mitigate the dangers associated with aluminum wiring that do not involve completely removing it, the best solution is to completely replace it with new copper wiring. If you are a lover of technology and old homes. “Techy” people tend to enjoy collecting the latest in televisions, audio systems, gaming systems, computers, and appliances. Many of the latest computers and entertainment systems are designed with the assumption that they will be installed in a new home with an up-to-date electrical system that has secure connections. Many people run into problems when the new device requires wiring that the house does not have. For example, many new kitchen appliances require a separate ground and neutral to run the computer controls. High end audio-visual equipment is sensitive to interruptions in power and can be damaged if the circuit that powers it has a loose hot or neutral connection. Wiring in older homes either does not contain the needed equipment ground and neutral to run high performance electronic devices, or it may be worn and contain many loose connections, leading to power interruptions that can damage the delicate circuitry of appliances, HVAC systems, computers, or audio-visual systems. If you live in a vintage home that you love. Some people enjoy the convenience and maintenance free lifestyle of owning a newly constructed home. However, new homes do not always have the character or style exemplified by some old homes. Whether your home is an old 1920’s Craftsman with cedar siding and painted columns, a 1940’s brick-front “federal” home, or a 1950’s glass-walled contemporary, you appreciate the style and workmanship that was built into your vintage home. However, there is a flip side to the coin. A local home inspector once said “From the moment it is built, your house is constantly trying to collapse on itself.” Maintenance and restoration is part of the reality of owning a vintage home. Replacing the electrical system allows you to live in a home that reflects your taste and style, but affords you the advancements in safety and convenience of living in a new home. Updated circuits to bathrooms allow for hair drying without blown fuses. New kitchen wiring allows for installation of the latest computer controlled appliances. Arc-Fault protection for bedrooms helps protect against fire. Networked smoke and carbon monoxide detectors give peace of mind at night. New branch circuits allow for reliable power to high tech audio visual systems. Recessed lighting updates the appearance of the home while adding the sense of space to small areas with low ceilings. Finally, security lighting can add safety when you are away. If you have small children. When it comes to dangerous objects, small children seem to be drawn in like a magpie to a gem. Because the electrical systems in older homes tend to have more loose connections and do not have as solid of a connection to ground as new homes do, it can make them a dangerous place for young, inquisitive minds. More often than not, rewiring a home includes replacing and upgrading the electrical panel and meter base, plus driving new ground rods, properly bonding the water pipes, and properly bonding gas pipes. When the service (includes the meter base, electrical panel, and all grounding and bonding components mentioned in the last sentence) is updated along with new wiring, the superior connection to ground makes circuit breakers more sensitive to ground faults and short circuits. If an unattended child sticks a fork or paperclip into a wall outlet, the corresponding circuit breaker will react more quickly, cutting power to that outlet. (That being said, a newly wired house would also be equipped with “tamper-resistant” outlets, which further reduce the possibility of children tampering with the electrical system.) It also goes without saying that whether or not your home is equipped with tamper resistant outlets, small children should be instructed to stay clear of wall outlets and carefully observed when they get near to them. If you have an elderly parent or family member. Rather than retiring in a nursing home, many folks prefer to remain in their home as they grow into the golden years of their lives. Many of these people have lived in the house since it was first built in the 1950’s or 1960’s and may have maintained the home impeccably as the years went on. However, even an old home that has been well maintained can suffer electrical failures. The electrical system in the home was engineered for the time at which it was built. Engineers of the time did not account for early 21st century technology with its high demand for electricity and low tolerance to power interruptions and surges. If a time comes when the owner requires special medical equipment, the electrical system may not be able to support it. Losing power to medical equipment or mobility equipment such as chair lifts can have a detrimental effect on quality of life until the power interruption is fixed. Installing a new electrical system in an older home can help an aging parent live more comfortably and securely in their family home. If your idea of “curb appeal” is safety. Most real estate agents will tell you the homes that sell the fastest and for the most money are the ones that look the best on the surface. These homes feature new windows, siding, and roofs. The yard is well manicured with fresh landscaping and lush, green grass. The minute the potential buyer walks through the door, they are greeted with rich hardwood floors, fresh paint, and sparkling new fixtures. The kitchen and bathrooms are well appointed with colorful mosaics, solid surface countertops and solid hardwood cabinets. However, for many of these glitzy homes, beauty is only skin deep. Once the drywall is peeled away, the original wiring and plumbing is still wasting away inside the walls. To make matters worse, the previous owner may have sacrificed quality electrical work and plumbing to buttress their granite countertop budget. In many cases we find original electrical systems that have been stretched well beyond their original design so that they can accommodate luxury kitchens and high-wattage recessed lighting. On top of that, the electrician or handyman may have cut corners by concealing splices behind walls or in the attic where they are not accessible in the event of a failure. We have seen many starry-eyed new homeowners spend hundreds of thousands of dollars on a dream home only to find that they need to spend several thousand more dollars re-working the wiring for improperly installed renovations. The very best builders are the ones who focus on building a quality home from the inside out with a strong foundation, structure, roof, electrical, plumbing, and HVAC. Then everything else falls into place. 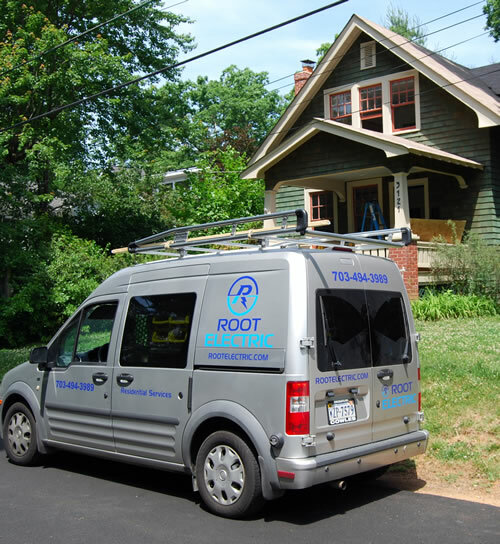 At Root Electric, our goal is to provide you with the very best electrical system for your safety and enjoyment. "I would definitely recommend this company and will use them again...."
"Excellent service all around. Bill Root came out and provided an estimate, and answered all the questions I had. The estimate was very detailed and an excellent price. Root Electric did an excellent job coordinating the schedule with me, their technicians, the county inspector, and the electric company so that everything would be completed the same day. When the work was performed, the 2 technicians arrived and got right to work. They were very thorough, professional and got all the work completed with no issues (no issues from the inspection either).I would definitely recommend this company and will use them again.